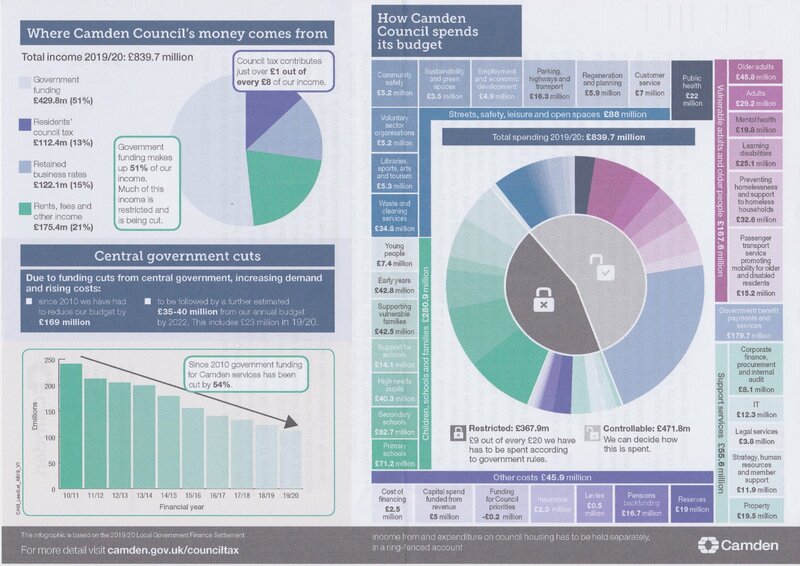 The council tax bill for a Band D property in Camden has increased by 5% average to £1,562.35 Greater London Authority increased their charge by 8.9% to £320.51 while Camden Council has increased the general expenditure charge and adult social care precept by 3% and 1% respectively. 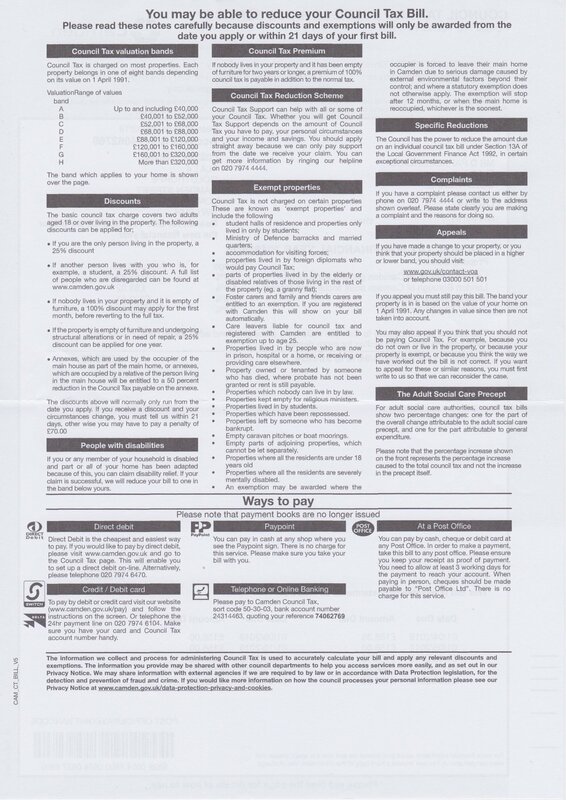 I wanted to get in touch to update you on changes to council tax for the year ahead. We are attempting to hold back a tidal wave of relentless pressure on Camden’s public services – and we are now reaching tipping point. As part of our financial planning, we have made the decision to raise council tax by 3.99%. This is equivalent to an extra 94p per week for a Band D property. This decision comes as government cuts to our funding reach 54% since 2010. Cuts, combined with increasing demand and a rise in costs, mean we have had to reduce our budget by £169 million since 2010, to be followed by a further estimated £35-40 million from our annual budget by 2022. Find out about our budget plans and watch a short video that explains our financial challenge at camden.gov.uk/financialchallenge. 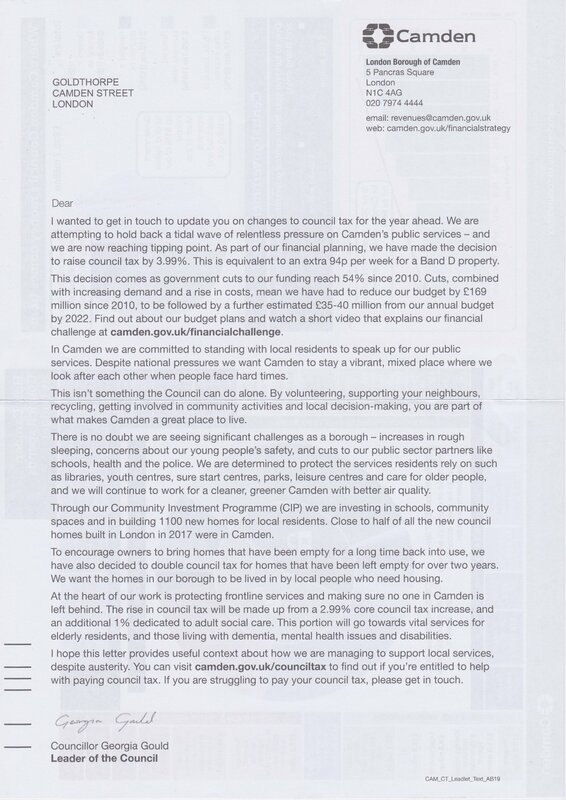 In Camden we are committed to standing with local residents to speak up for our public services. Despite national pressures we want Camden to stay a vibrant, mixed place where we look after each other when people face hard times. This isn’t something the Council can do alone. By_vpjunteering, supporting your neighbours, _ recycling, getting involved in community activities and local decision-making, you are part of what makes Camden a great place to live. There is no doubt we are seeing significant challenges as a borough – increases in rough sleeping, concerns about our young people’s safety, and cuts to our public sector partners like schools, health and the police. We are determined to protect the services residents rely on such as libraries, youth centres, sure start centres, parks, leisure centres and care for older people, and we will continue to work for a cleaner, greener Camden with better air quality. Through our Community Investment Programme (CIP) we are investing in schools, community spaces and in building 1100 new homes for local residents. Close to half of all the new council homes built in London in 2017 were in Camden. To encourage owners to bring homes that have been empty for a long time back into use, we have also decided to double council tax for homes that have been left empty for over two years. We want the homes in our borough to be lived in by local people who need housing. elderly residents, and those living with dementia, mental health issues and disabilities. I hope this letter provides useful context about how we are managing to support local services, despite austerity. You can visit camden.gov.uk/counciltax to find out if you’re entitled to help with paying council tax. 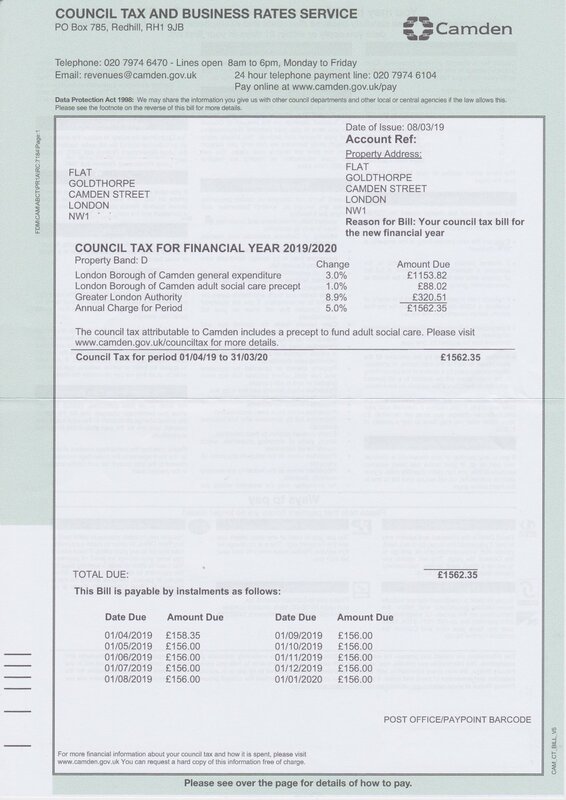 If you are struggling to pay your council tax, please get in touch.